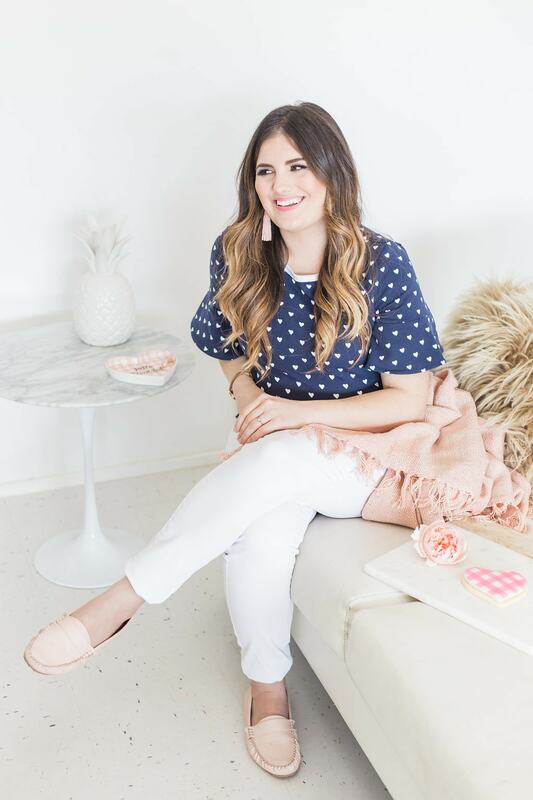 I am at it again sharing my absolute favorite, go-to Sugar Cookie recipe on Reese Witherspoon’s Draper James Blog! If y’all have not tried my favorite Sugar Cookie recipe yet, it’s an absolute must! ;) I know I regularly mention these cookies to you guys, but this recipe is an absolute keeper! It’s the ONLY Sugar Cookie that will hold its shape and not break when transporting. I’m telling you right now, it’ll be love at first bake! So the truth is, I have been using this recipe for the past 12 years and it has yet to fail me! I tried several different variations, but none are quite as heavenly sweet as this recipe. The secret is the hints of almond extract. I’m definitely a little biased because I may or may not be a bit of an almond addict (hide your bear claws and almond paste), but trust me! The almond seriously gives the cookies the most amazing taste. Okay so back to cookie talk! Once I cracked the code for these Sugar Cookies, they quickly became a family tradition. I even used this recipe for Charlie’s baby shower cookies. When I was planning, I knew I needed a simple recipe that I could easily make in large quantities that all of my guests could enjoy. What better option than some tasty Sugar Cookies? Plus I swear these cookies never lose their shape when baking! Just another reason to whip out a batch for any event or party! I can’t help myself and bake these cookies year-round… Seriously, one year I baked them and my mom and I snuck these exact cookies into the movie theatre. They’re THAT good! ;) You truly don’t need a holiday to bust out this recipe. But I do look most forward to making them around Valentine’s Day! I know plenty of people are firm believers in Red Velvet EVERYTHING for the 14th, but Sugar Cookies trump Red Velvet every time in my book ;) Plus, who needs all of that red dye, right?! ;) Of course you can snack on them just the way they are, but you can also get so creative with Sugar Cookies! I think it’s the versatility of Sugar Cookies that makes them a perfect pairing for Valentine’s Day. Every year I love making a ton of these cookies and assembling little bags for our team, friends, and family members. It’s such an easy and inexpensive gift, but still a great way to show them some love. 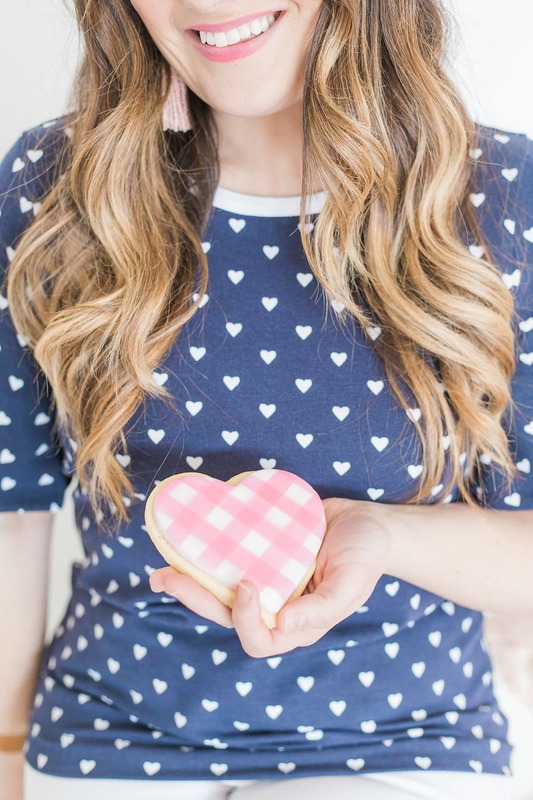 You can cut a few of the cookies into different sized hearts, play with a combination of pink, white, and red frosting, and of course pile on the sprinkles! ;) No matter what, you end up with a tasty treat for Valentine’s Day! If we’re being honest here, my Valentine’s Day celebrating doesn’t exactly end with my Sugar Cookie marathon. If anything, that’s only where it starts! I was actually just confessing to being a Valentine’s Day fanatic in a recent interview with Draper James. You should totally read the full interview to hear just how crazy I get with the holiday, but I can’t help myself! 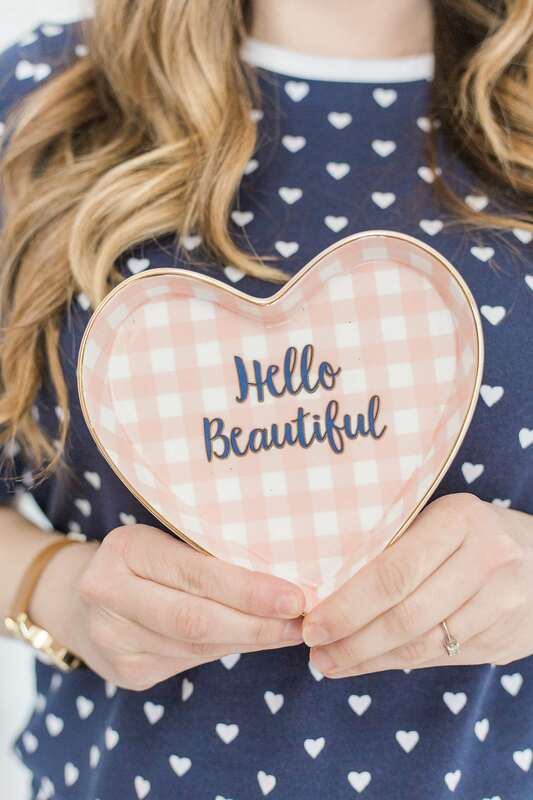 Now that I’ve admitted to all of my holiday craziness, what are some of your favorite Valentine’s Day traditions? 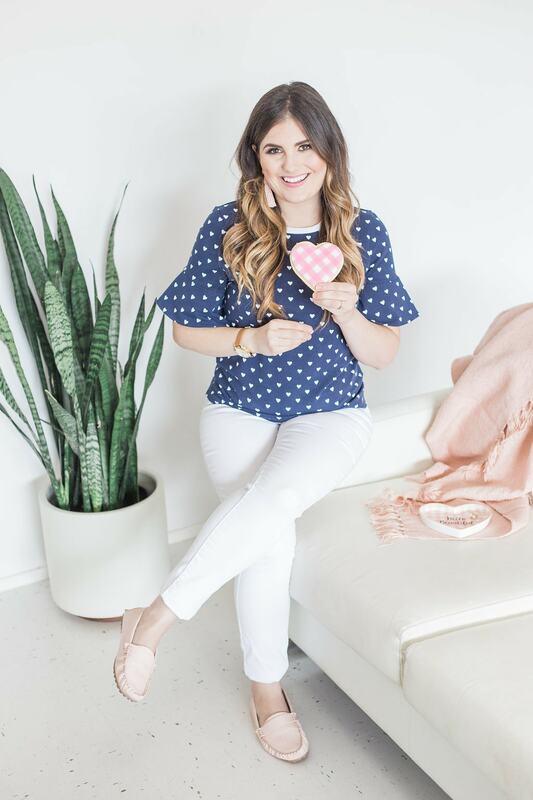 I can’t wait to hear how you all share the love with the people you care about and I really can’t wait to hear about all the different ways you guys use and decorate these Sugar Cookies! 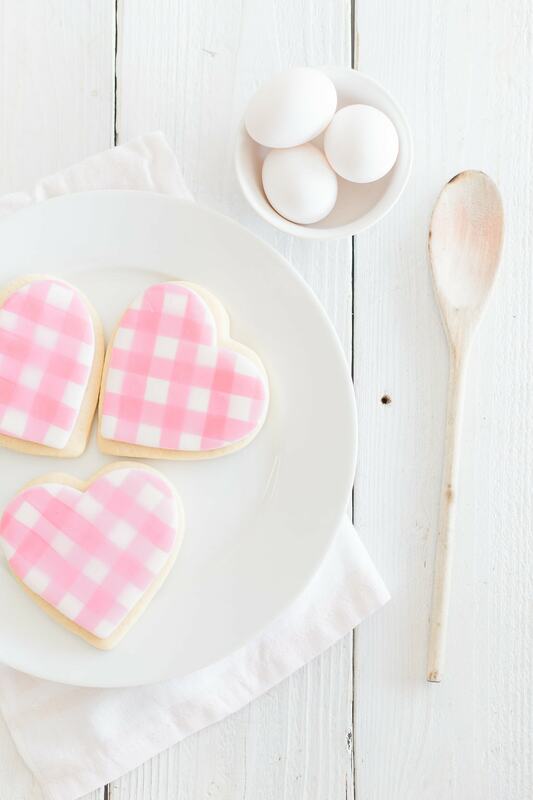 Happy baking and Happy Valentine’s Day! These are so beautiful! 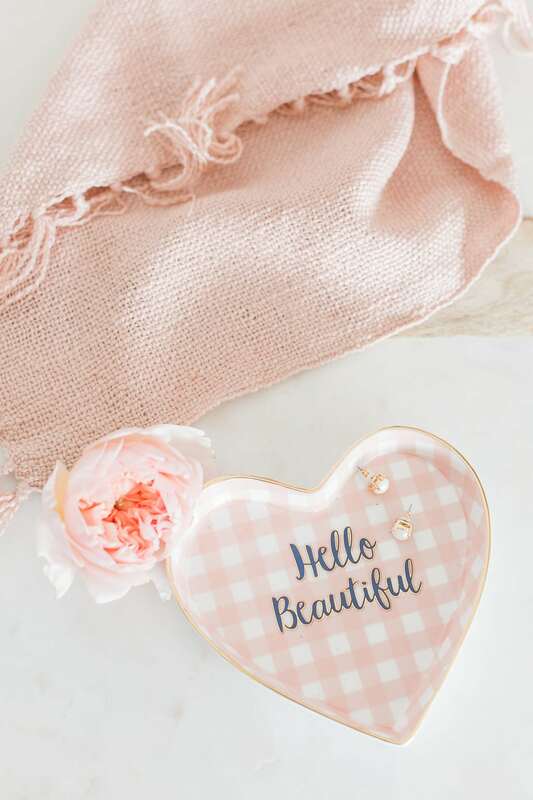 I adore gingham, especially if it’s pink. I almost wouldn’t want to eat these, they’re just too pretty ???? 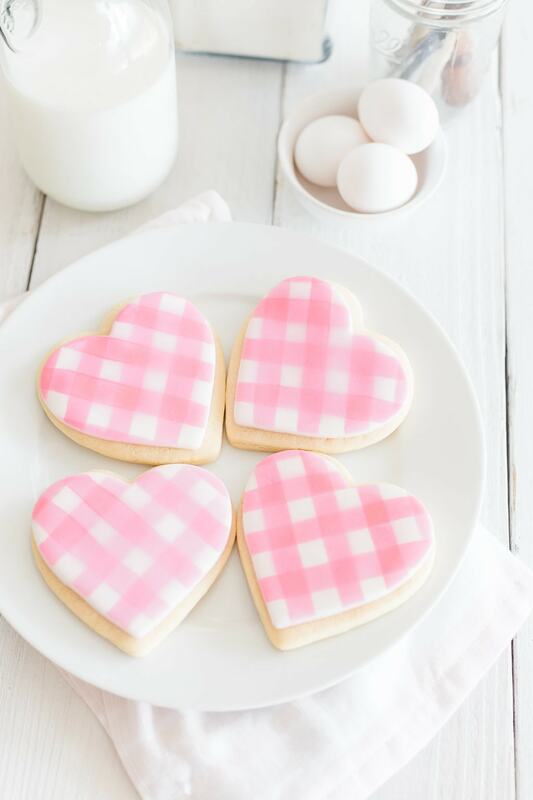 How did you create the gingham effect on the cookies?